Click image to enlarge Linnton, Oregon. Image taken March 19, 2006. The Oregon community of Linnton is located on Oregon's Highway 30 along the Willamette River at River Mile (RM) 5 (approximately Columbia River Mile 105). The western end of the St. Johns Bridge leading to the community of St. Johns is located one mile upstream, and the head of the Multnomah Channel and upstream tip of Sauvie Island are located 1.5 miles downstream. The Tualatin Mountains rise above the community. 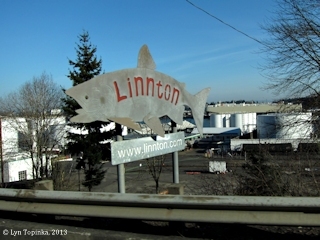 North of Linnton along Highway 30 is the small community of Burlington and Scappoose. South along Highway 30 begins Portland. Captain Clark and seven of his men journeyed through the Linnton area on April 2, 1806, as they explored the Willamette River, traveling as far as the St. Johns area. They again passed the Linnton area on April 3, 1806 as they returned back to the Columbia River. They spent the night of April 2 camped across from Linnton at the location of today's Terminal 4. 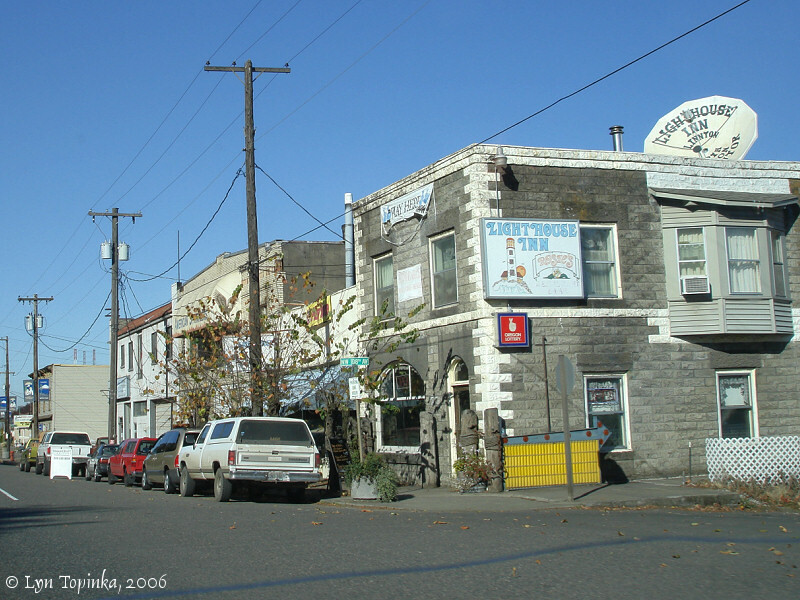 Click image to enlarge Linnton, Oregon. Image taken January 2, 2013. Lewis and Clark passed the location of Linnton, Oregon, on April 2, 1806, and again the next day, April 3. Linnton was laid out in 1843 by Peter H. Burnett (who would go on to become the first governor of California) and M.M. McCarver. 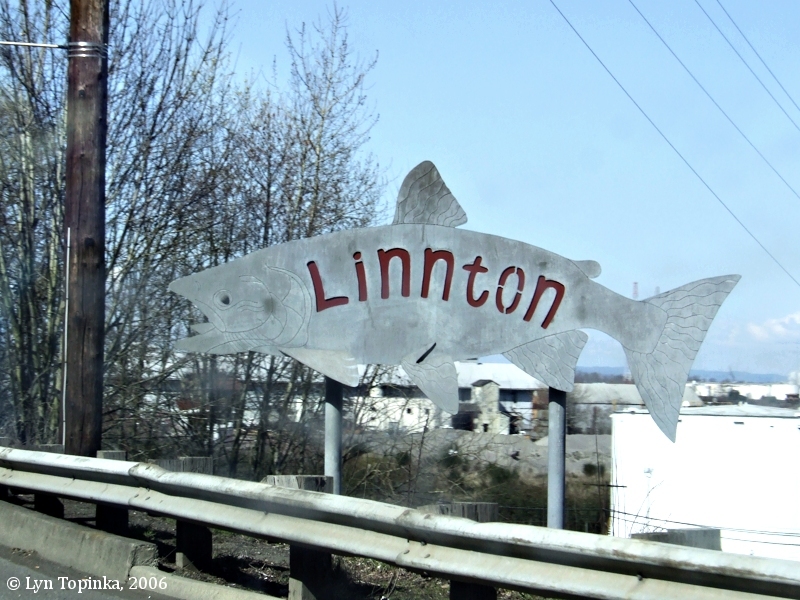 Burnett and McCarver named their community "Linnton" after Senator Lewis Fields Linn of Missouri, who, in the 1830s was a strong supporter for American occupation of Oregon and for granting land to settlers. Senator Linn's ideas went on to become the Donation Land Act in 1850. The Linnton Post Office was established in 1889 and discontinued in 1975. Today the community of Linnton is part of the City of Portland. 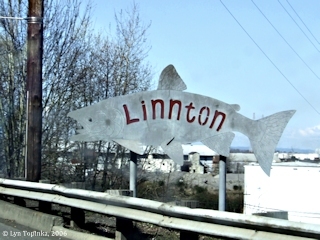 In 1914 the U.S. Board of Geographic Names made the name "Linnton" official. Other variants seen were "Linton". "... LINNTON, 7.9 m., a part of Portland since 1915, was founded in the 1840s by Peter H. Burnett, later, first governor of California. He visioned the tiny town as the future metropolis of the Columbia Valley but Portland drew most of the shipping trade and Linnton languished. At present it is an important industrial district of the city; large lumber shipments leave from its wharves. 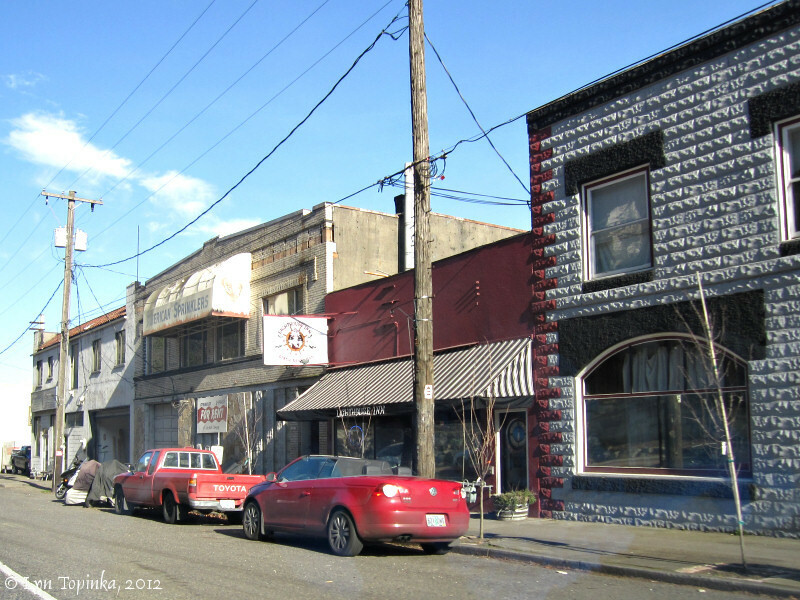 ..."
Click image to enlarge Street scene, Linnton, Oregon. View from car driving west on Highway 30. Image taken October 31, 2006. 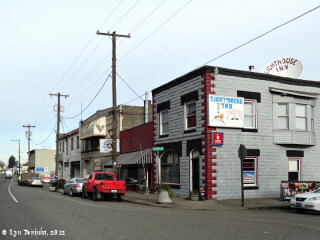 Click image to enlarge Street scene, Linnton, Oregon. View from car driving west on Highway 30. Image taken January 13, 2012. Click image to enlarge Street scene, Linnton, Oregon. View from car driving west on Highway 30. Image taken February 4, 2012. According to the 1895 "Lights and Fog Signals of the United States" (1895, Government Printing Office) the "Linton Landing Post Light" was a fixed red lantern on the western gable of an unpainted sawmill on the wharf at Linton, Oregon. The light was established in 1887. The Linnton to St. Johns ferry began in 1905. "... [on the] St. Johns ferry, cross [the Willamette] to the Linnton road. The ferry is free and runs back and forth constantly, entrailing but little delay. In planning the trip it should be remembered that the second Sunday of each month is "boiler day" for the ferry, however, and it is not in operation. An excellent view is secured of the lower harbor and the splendid municipal terminals at St. Johns." Source: "Sunday Oregonian", May 22, 1921, courtesy Historic Oregon Newspapers Archives, Univeristy of Oregon Libraries, 2016.